All finishers will receive a Carlsbad Triathlon t-shirt! Sprint Plus Swim will start on the beach at Cherry Ave and swim in a counter clockwise direction (south) towards swim exit/transition. Sprint will start on the beach at Redwood Ave and swim in a counter clockwise direction (south) towards swim exit/transition. Make sure you are in a low gear to get up the hill out of the transition area. Head south to La Costa. Sprint Plus completes the additional loop with a u-turn heading northbound at Solamar Drive. back to La Costa. Sprint completes the out and back to La Costa. Start at Tamarack Ave/Transition Area, head north along the sea wall. At the end of the sea wall run up the small hill at Pine Street to head south on Carlsbad Blvd, cross over the Agua Hediona inlet before u-turning again (in line with Tower 30 by the plant). 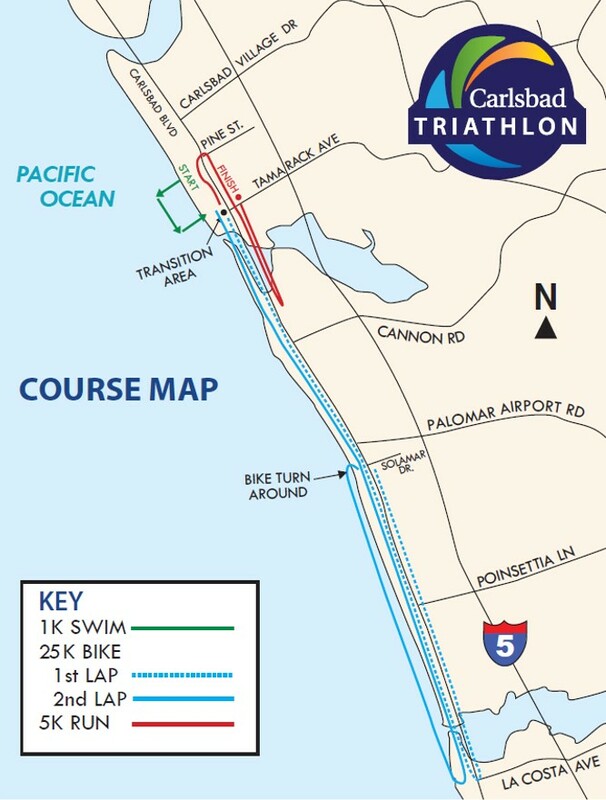 Duathlon’s first 1 Mile Run – Start/Finish line arch on PCH (easy to find). Head North until the U-turn. Head South along the seawall to the Transition Area. Get to know the swim course, overcome fears, and familiarize yourself with the buoy placement. Participants will learn how to navigate the surf, what to look for in the current, swim exit, reefs, and even take a splash in the waves. Brian Long, long-time triathlete and local Carlsbad resident, along with various coaches, volunteers, and lifeguards will brief participants on what to expect on race day. This is a free event, however all participants must have the 1-day event or annual USAT membership. Take Interstate 5 to Tamarack exit. Go west six blocks to Garfield. Turn left or right at stop sign and find street parking. Park in a residential area and walk one block west to Carlsbad Boulevard. The athlete check-in, transition area and finish line are along the bluff, north of Tamarack Avenue. Please be courteous of residents in this area! Do not block driveways and keep voices low early Sunday. Do NOT park in “no parking areas” or along the railroad tracks. Violations will result in ticketing and towing. Please arrive to transition no later than 6:30am. Allow plenty of time for parking. Safety and Weather: If there are extreme weather conditions including, but not limited to, high surf, strong rip currents, or poor visibility due to fog, the swim portion of the race may be canceled. The triathlon would then transition into a run-bike-run. The California State Lifeguards will assess the water conditions the day of the race. Safety of all participants is our priority. Time Limits: Participants who will not finish the race by 10:45 a.m. will be required to exit the course. This will be strictly enforced by the Carlsbad Police Department.